Mithai bucket list ..Is that the first time you have heard about it ? Let me assure that it exists albeit in my mind . Also, if I have not mentioned it before , let it be known to the gentle reader that I am a Gemini and a typical one at that . In simpler terms it means that I get bored with repetition and to keep my creative juices flowing , I have to try something new now and then. Suffering from a case of the aforementioned, I decided to do something about my imaginary mithai preparation list . 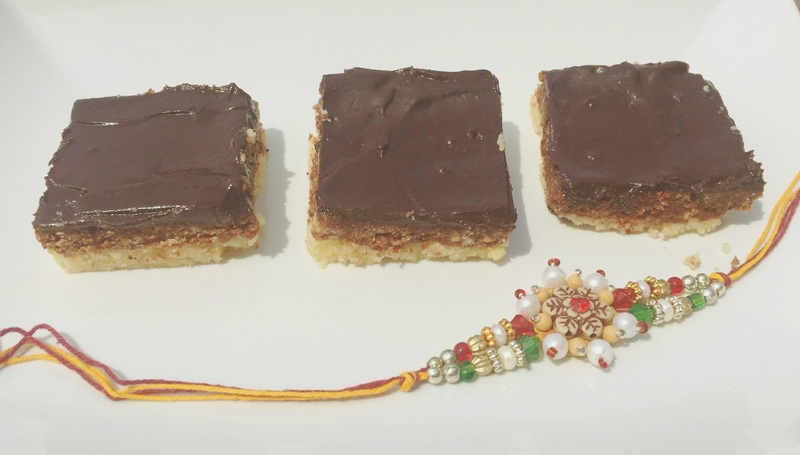 Why chocolate barfi ? Simple answer - I love it !!! I am not a very big chocolate fan( truly) but chocolate barfi is something that I simply cannot resist. The appeal may be due to the quite obvious fusion of traditional and western flavors. So, can you guys then blame me for giving it the honor of being the first mithai to try in my bucket list ? Determined in my resolve and with a fair bit of excitement thrown in , I visited the local grocery store to buy the main ingredient - Khoya or mawa . Milk powder simply does not do for me. I have this annoying habit of doing things the proper way, however lengthy and tedious the task may become as a result of it.Seem to have "inherited" the habit from my hubby . Husbands are always a convenient excuse when you have to blame a bad habit on someone else. I really hope you guys agree. Anyways, armed with the khoya and back home. I kept on delaying the obvious task...a certain apprehension at trying something new might have been the culprit. See, I don't blame my husband always!! Baking is something that I am comfortable in. A new bake, however daunting it may be does not faze me but mithai is altogther a different ball game. But shirking form the mithai preparation duty was impossible as I had already announced it on my FB page and few friends were eagerly waiting for the pics. So , just took a deep breath, evoked the Almighty for courage and luck and started with the preparation. Note : I like to think that I was moderately successful in my endeavor so it won't seem out of place for me to advice you guys on how best to get the desired results . I learnt a few things and armed with that knowledge , I do believe we can achieve even better precision . First , go in a for a smaller tray for setting the mithai. The more compacted, the more firmer the result . I also found the chocolate covering too thick for my taste , so took the libery of adjusting the proportions. Grate the khoya for uniform consistency. Now , in a non stick pan over medium heat , add the khoya and sugar and start mixing them . Make sure that you stir them continuously otherwise the khoya will stick to the bottom. After 7-8 minutes of continuous stirring , you will get the desired consistency . Remove from heat and divide the mixture into two parts . Take a small tray and line it with parchment paper . Take one half of the mixture and spread it evenly in the tray with the help of the spatula.let stand for 15 minutes or more. While it is setting, to the other half of the mixture, add 2 tbsp of cocoa powder and stir well to blend. Spread the mixture on top of the plain mixture with the help of a spatula. (see second last pic). Let it set and cool down for 15 - 20 minutes. Now ,in a saucepan over medium heat , add the semi -sweet chocolate , milk and butter and stir to make a smooth paste. Pour the paste on top of the cocoa layer and spread evenly. Let it stand for 1-2 hours (can refrigerate too) and then cut into individual pieces and enjoy !